Sounds like it might be the vacuum reserve canister. That helps to keep/smooth vacuum at idle. That's because the cam/engine is "lopey" (https://www.corvetteforum.com/forums...ivability.html , https://ls1tech.com/forums/generatio...-ness-cam.html ). If your car is a 85 GT with the M code engine it’s the vacuum controlled heat riser valve. Used to help speed engine warm up. 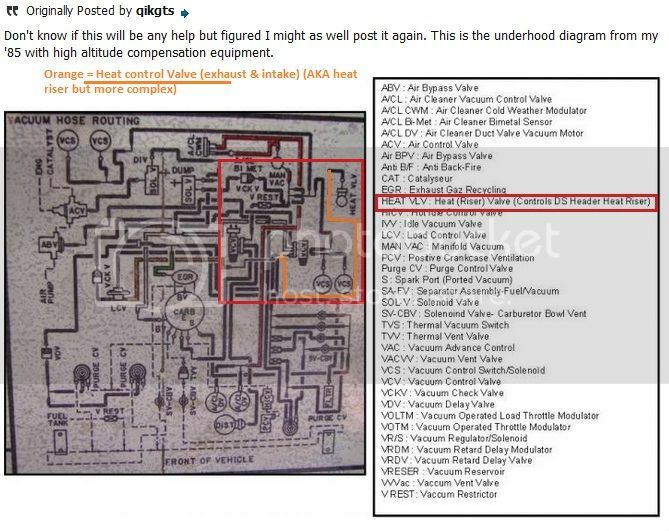 See qikgts Vaccum Emissions Control Info diagram CHB E5AE_9C485 for his 1985 Hi Altitude 4V GT. 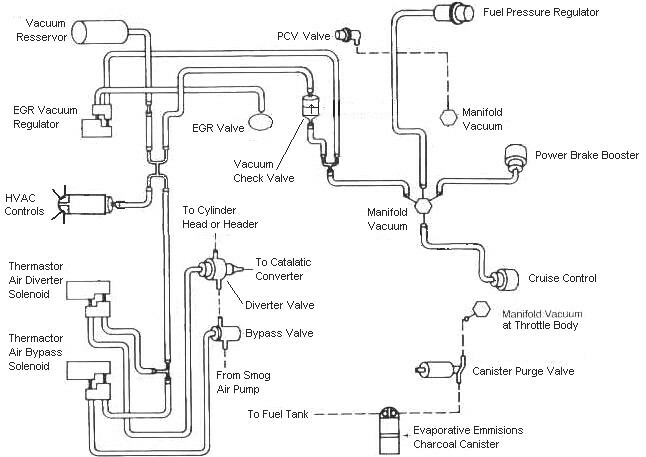 Its a normally open canister which controls the exhaust diversion to the primary light off catalyst. boboli photoed it, its the item on the top of the picture that looks like a waste gate actuator. The earlier 83 and 84's with 4-bbl carbs (not the CFi's) had no tubing headers, and had another kind of secondary heat stove which blocked off one side of the exhaust to pre-heat the primary light off oxidation catalyst. Its some times called a flapper valve too. The 85's have a bigger 2.75" one, not the earlier 2.375". Since you asked about the heat riser, I found one of the 85 ones I have. I think I tossed the other long ago. There are 2 on ebay right now( 1 used and 1 new) that look exactly the same. the label on the vacuum canister has long since been destroyed, so I can't read any #'s. The label almost looks to have a bluish color, but I can't say if that is original or just from time. The original on ebay has a red sticker. Maybe they are color coded to size? The only cast # on the valve body is a #4 right at the corner, near the vacuum canister. Last edited by xctasy; 02-07-2019 at 09:44 AM.